10 days paid leave would cost just five cents per employee, new campaign claims. 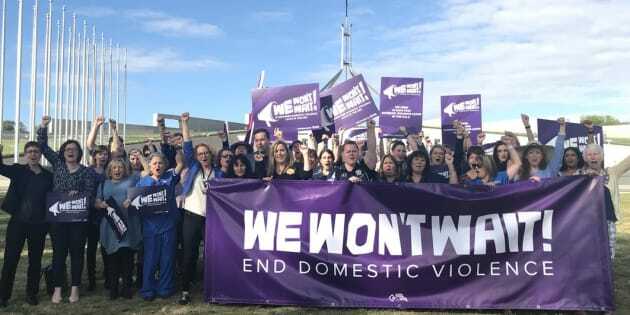 CANBERRA -- Trade unions and frontline health workers are placing renewed pressure on the federal government to legislate a national domestic violence leave scheme, with a new campaign claiming such a reform would cost just five cents per employee. Nearly 40 women have been killed as a result of domestic violence this year, with supporters of the paid leave scheme saying the changes could help lower Australia's death toll. However, Australian Council of Trade Unions president Ged Kearney claimed no member of the Coalition government would meet with campaigners on Thursday, calling it a "disgrace" the coalition had been ignored. Unions have long pushed for 10 days of paid domestic violence leave to be included in national employment standards. Domestic violence leave, as a separate category of leave to holidays or sick leave or bereavement leave, has existed in Australia for around a decade. Big companies like Qantas, the NAB and Commonwealth banks, and Virgin offer domestic violence leave, and the Australian Council of Trade Unions said around one million workers are covered by such schemes in this country. However, it is only offered by employers on an opt-in basis, and is not compulsory. On Thursday, a coalition of union leaders and members of frontline health services including paramedics and social services descended on Parliament House in Canberra to beg politicians to insert domestic violence leave provisions into minimum employment standards, making them available to all workers nationwide in the same way that sick or holiday leave is. "We know a large proportion [of domestic violence victims], nearly two-thirds, are in paid work and if they lose their job we know the consequences of the situation are dire. They perhaps can't leave because they don't have financial security or independence. They find themselves homeless or having to find refuge with the services these people provide," Kearney said on Thursday, motioning to the collection of frontline workers behind her at a press conference. "This is something that is incredibly important to the women who are in work, to keep their job. If women can keep their job, have access to paid family and domestic violence leave, we know that it can make a world of difference. It can be the difference between escaping a violent situation or having to stay." A woman named Sam, a domestic violence worker in western Sydney, said a dedicated category of leave would give victims time to deal with all the issues surrounding domestic violence, such as attending court dates or making emergency arrangements for housing and childcare. "Women know their employment offers them security in the long term and they won't do anything that will jeopardise their employment. I've spoken with women who, faced with the choice of going to court or going to work, will go to work," Sam said. "Ten days paid leave would provide women and their children an opportunity to be supported while they leave an abusive relationship." Pressure has been mounting on the federal government to allow a dedicated domestic violence leave category for some time. The Fair Work Commission recently issued a "preliminary view" that it was "necessary" for 10 days of unpaid leave to be inserted into modern awards as a mandatory entitlement, but ultimately rejected a union push for paid leave. The issue has also been raised at recent meetings of the Council of Australian Governments (COAG). Queensland premier Annastacia Palaszczuk said in December 2016 that she would be pushing for national guidelines for domestic violence leave, saying Queensland "was the first state with legislated domestic and family violence leave arrangements". Kearney said the federal government had ignored the issue, and had refused to meet with the 'We Won't Wait' campaign. "We're incredibly disappointed about that and we think it says a lot about how the current government views the plight of people suffering family or domestic violence," she said. "That's totally unacceptable. We hear them talking about mandatory reporting, all sorts of laws and legal restrictions, but here is something that is incredibly important. We know this is a scourge right across the country but the government of the day is not even prepared to talk about it with us. They've dropped it off the COAG agenda. This is a disgrace." "We've had lots of research done to show it doesn't cost a lot of money. On average it would cost about five cents per employee to implement a policy like this that could save hundreds and hundreds of lives. The cost is really not the issue anyway, the cost is people dying at the hands of partners. This is an issue that needs to be taken up by legislators, and quickly."